Buy through MusicWeb for £12.49 postage paid. As an academic working in a British university I have often observed the results of research projects funded by the AHRC (Arts and Humanities Research Council). Only very rarely do such projects make so potentially rich a contribution to both knowledge and pleasure as that for which Adrian Chandler, violinist and director of La Serenissima, received three years funding. This was for work as a Research Fellow at Southampton University, studying the development of the North Italian violin concerto between 1690 and 1740. His work has, I am sure borne fruit in a number of ways and forms - and he will have filled in plenty of forms too. Here, the most immediately relevant of such ‘fruits’ has been a series of three CDs (see reviews of Volume 1 and 2). 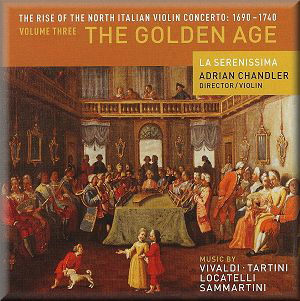 The first sampled the early days of the concerto, culminating in some of Vivaldi’s early concertos; the second was wholly devoted to Vivaldi’s concertos; now this third volume illustrates Vivaldi’s mature work alongside the work of some of his younger contemporaries and successors. The high standards of musicality and, indeed, of recorded sound which characterised the first two volumes are wholly maintained here. La Serenissima is one of the best of Northern European ensembles playing this kind of repertoire, Chandler’s interpretations always characterising the music intelligently - without wilful eccentricity or excessiveness - the ensemble’s playing full of a relish for the particular sounds and textures of period instruments, though never at the expense of the music’s shape and drive. Contrapuntal textures remain clear and audible, rhythms are sharp and judiciously emphatic. The Locatelli concerto da chiesa is music of exquisite gravity and dignity, an effect enhanced by the use of the pipe organ in the continuo section. There are echoes of Roman concerto grosso form, with the solo group made up of two violins and two violas. The choice of tempi throughout is utterly convincing, the playing altogether persuasive. The same composer’s concerto for four violins - a form that was dropping from favour by this date - is less immediately appealing, even though thoroughly pleasant, especially in its central largo – in which the presence of Elegio Quinteiro’s theorbo adds some striking detail. The concerto by Vivaldi which opens the CD is very engaging, the sound of the woodwinds (2 oboes and a bassoon) and the horns gorgeously rich and evocative, Vivaldi’s melodic invention impressive. Vivaldi brings to the best of his instrumental music - as indeed to much of his sacred music - a distinctive theatricality, an all-pervading sense of the dramatic; such qualities are very evident in RV 562a. It is no surprise – and is entirely fitting – that this concerto should have been performed at the 1738 celebrations of the centenary of the Schouwburg theatre in Amsterdam, where its three movements respectively accompanied the opening of the curtain, the appearance and descent of a cloud and, finally, the opening of that cloud to allow the appearance of Apollo. Here the timpani and horns, as well as the woodwind, make for vivid music which, like all the best music, seems simultaneously both surprising and inevitable. It makes a marvellous conclusion to this set of discs. Before we get to that conclusion we are treated to Sammartini’s very pleasant study in colour and texture, in a concerto which is not perhaps of any great distinction or memorability melodically speaking, but which is also interesting for its clear anticipations of the classical as its composer begins to leave behind the conventions of the baroque. As Adrian Chandler reminds us in his excellent booklet notes, Sammartini taught Gluck and assisted the young Mozart in the preparation of Mitridate – such affinities are evident here. The concerto by Tartini is perhaps the least compelling of the pieces anthologised here (though it is well worth hearing). The largo has a certain elegiac charm, but a number of Tartini’s movements don’t seem to make the most of their musical materials. It would, though, be quite wrong to end this review on even the slightest of downbeats. Everywhere on this CD – as on its predecessors – there is interesting music - and some of it is much more than merely interesting - played with confidence and ease, in performances grounded in thorough and scholarly knowledge balanced by an unexaggerated zest and obvious affection. Rarely has the AHRC’s money been so well spent!